This past week I was involved in a remedial wall tie installation on a prestigious brand new building, which is not yet complete. 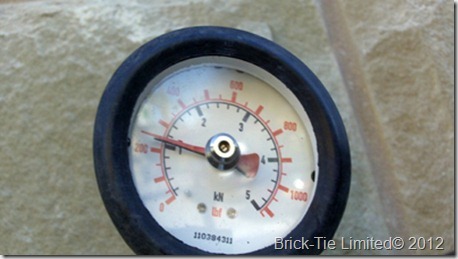 Surprisingly the need for wall tie installation on new and fairly new buildings is more common than many would expect. Reasons for this include: new wall ties missed during the bricklaying; poor embedment of ties in one or other leaf; poor choice of new ties and ties installed inclined down towards the inner leaf. There are other reasons too, but the forgoing are the most common. On this contract some ties had been inadvertently omitted from the structural piers in a commercial/retail building in West Yorkshire. What happens when wall ties ‘off the shelf’ don’t work. It wouldn’t be newsworthy in itself, as I deal with this sort of work all the time. However, this job well illustrates the difference between new-build masonry construction, where new ties are installed by the skilled bricklayers – as opposed to remedial wall tie work, which as events on this site illustrate, is a job for trained and qualified remedial tie technicians. Anyway, the site supervisors and engineers discovered that there was a potentially serious problem with essential cavity wall ties missing. Of course, the masonry sub-contractor was immediately informed and action was demanded to rectify the situation, by installing stainless steel remedial ties. If at first you don’t succeed…. get someone to help. The construction was a stone external leaf and concrete block inner with a 290mm cavity. 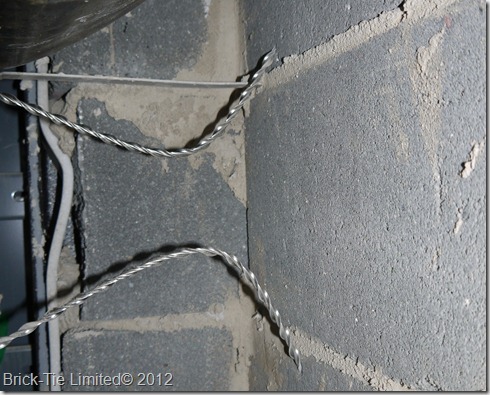 A helical profile remedial tie was deemed appropriate and was duly integrated into the specification. However, when this was passed to the masonry contractor he was keen (understandably), to save time and cost. A quick internet search found many on-line sites selling remedial ties, including helical ‘friction’ fit ties and easy to follow installation instructions. Within a couple of days the remedial cavity ties were on site and the bricklayers were instructed to install them immediately. Fast forward a few more days and it became necessary to open up the wall for another matter – the useless installation was revealed and the proverbial hit the fan – that’s when the structural engineer called me to site. Once there I could see what the problem was and quickly organised a remedial solution using Helifix. However, I have sympathy for the poor bricklayers; being pilloried by the engineer and the main contractor was not pleasant for them at all – Did they deserve this stick? No way, I’m on their side and here’s why. Bricklaying is a skill and is taught to a national standard. Those who pass the tests and assessments can turn their hands to build almost anything; stone, bricks or concrete blocks. There is absolutely no mention of remedial wall tie installation in the curriculum or in any module they study… why should there be? let’s face it, they are trained to drop wall ties onto open bed-joints or fix frame cramps to exposed surfaces. Fiddling about down blind holes of various lengths is not something they are used to. Now imagine the situation on site when something goes wrong; Money is at stake – bills go unpaid and the pressure is on to get the problem sorted. Remedial wall tie work is not rocket science, but some wall tie suppliers go much further to sell their goods; now dumbing down the skills involved in wall tie installation to the level, which is far below the reality. So when you need wall ties installing and search Google, you get all these adword adverts for web shops, selling wall tie kits and such, with a few simple ‘flash’ animations to show you how easy it is – why not do it yourself? Is it that simple? Clearly not on the above contract. I don’t need to employ a wall tie specialist do I? What about the tools to do the work properly, regardless of the width of the cavity or the condition of the stone or blocks? What about a surveyor to asses the job beforehand and make sure that the chosen tie is appropriate and the installation method is sound? What about a quality control system and a tie testing regime and test rig to make sure staff don’t walk away and leave a poor job? What about the experience to adapt the work if the initial specification proves unable to meet the required performance? This is why I don’t blame the lads who forced those ties in and left the job like it was. The fault lies with poor supervision, lack of training and a failure to recognise that the remedial work required a specialist in the first place. In view of the nature of the work testing was carried out to BRE 401. 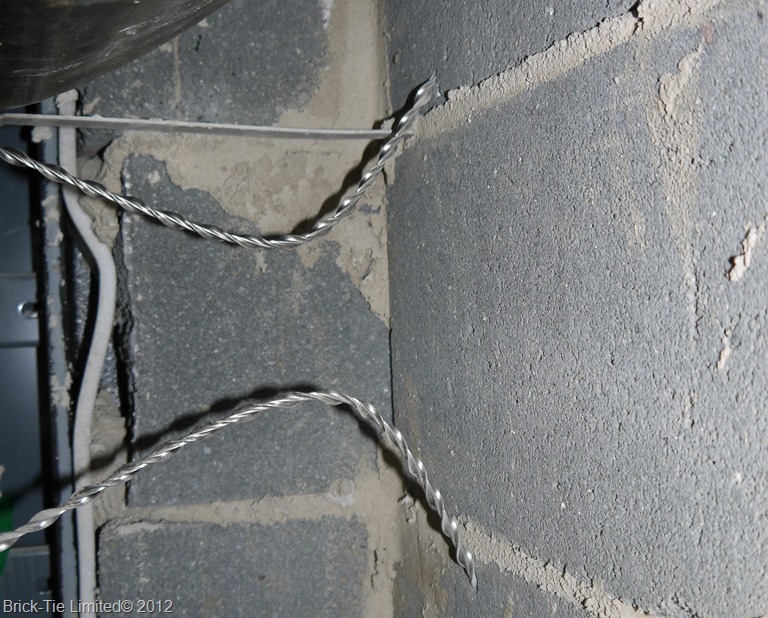 There is an NVQ in remedial wall tie installation for a reason; it is something which requires diligence and the correct training and equipment. The bricklayers maybe have the diligence, but lack both the other ingredients essential to a correct job. Lack of experience counts too, so they didn’t know that with such a wide cavity a special bespoke fixing tool was needed. They didn’t have the testing equipment so of course the defective installation went undetected, until accidentally discovered and they didn’t have the knowledge or spare equipment to fix the problem. Specialists are dealing with these issues all the time and that is what provides the essential experience they need. They’ve made the mistakes years ago, being guided by their supervisors and they’ve faced having to change installation methods at short notice. All this means that on site, they are not re-inventing the wheel every day; using unfamiliar equipment and they are not using the clients building as a training ground. Don’t leave wall tie work to a general builder; use a specialist who is a member of the Wall Tie Installers Federation and/or The Property Care Association. Ask for a detailed specification and insist on on-site random tension testing so that any issues are identified and rectified before the specialist leaves site. Staff should have NVQ level 2 in wall tie replacement. Guarantees are all well and good but experience shows that where work is hidden from view it is liable to be subject to less care on site – this is a sad fact of life, which in the case of wall ties is crucial – they have to work!